baby potatoes recipes. indian baby potatoes recipes collection. Baby potatoes are well, babies! They are potatoes that are removed from the soil before they are mature, and like babies are sweet-natured, baby potatoes are sweeter than the full-grown potatoes too. That sounds like an awful analogy but it does serve the purpose of explaining what baby potatoes are. Small and pretty, the baby potatoes have a white inside covered by a light brown peel that is very thin. They can be had peeled or unpeeled. While the peeled ones are more on the sweetish side, the unpeeled one has a nice nutty tinge to it. The slightly sweetish taste of baby potatoes combines beautifully with most herbs and seasonings making it a very popular ingredient, especially for curries and starters. Baby potatoes are available commonly all over the world, and can be used in both Indian and continental dishes. You can make much more than just curries and starters with it, as you are just about to discover. 1. Baby potatoes taste similar to regular potatoes but they have a tender, mildly sweeter taste. 2. In fact, if you cannot find baby potatoes, you can use regular potatoes cut into cubes. 3. Nevertheless, baby potatoes do look cute and dainty and are a pleasant addition to any recipe. 4. It is very important to wash your baby potatoes well and remove any green patches before cooking. 5. You must cook the baby potatoes in salted water or they will have a bland taste. How do you select and cook your baby potatoes? Make sure your baby potatoes are firm and free of dirt, grime or any blemishes. Check that the skin is smooth and doesn't have mild green patches. The green patches indicate the presence of solanine – a toxic pigment that should be removed before cooking. Try to pick baby potatoes of the same size so that they will cook uniformly. • Wash the baby potatoes well. • Boil them in enough salted water in a pressure cooker for at least 3 whistles. • You can also boil them in a regular open vessel on the gas stove but it will take a long time. The baby potatoes can be used whole or halved, peeled or unpeeled. You can simply peel the potatoes, season them with a little salt and pepper and enjoy right away, or you can use the baby potatoes in other dishes. Wondering where to start? The Dum Aloo is unarguably one of the most popular recipes using baby potatoes! It is made in different ways in different regions. You can try the restaurant style Dum Aloo, or the way it is made in Kashmir or Banaras. You will see distinct differences in the flavor and texture of these dishes. Looking so attractive and being so tasty, baby potatoes are perfect to make chaats with. Its mild taste is also a good playing ground for the chatpata flavors of the chutneys and spice powders! Thankfully, this tasty ingredient is also healthy! Baby potatoes are low in calories and naturally fat-free and cholesterol free. They are also a good source of fibre and minerals, not to forget a moderate dose of vitamins like folate, Vitamin C, B1 and B6. These keep your nervous system, heart, bones, gums and teeth healthy, and help resist infection and stress. All the more reason to go for these yummy and attractive potatoes! Have them soft and succulent, crisp and scrumptious, mildly seasoned or spicy, whichever way you like. You can discover many more recipes with baby potatoes on our website. 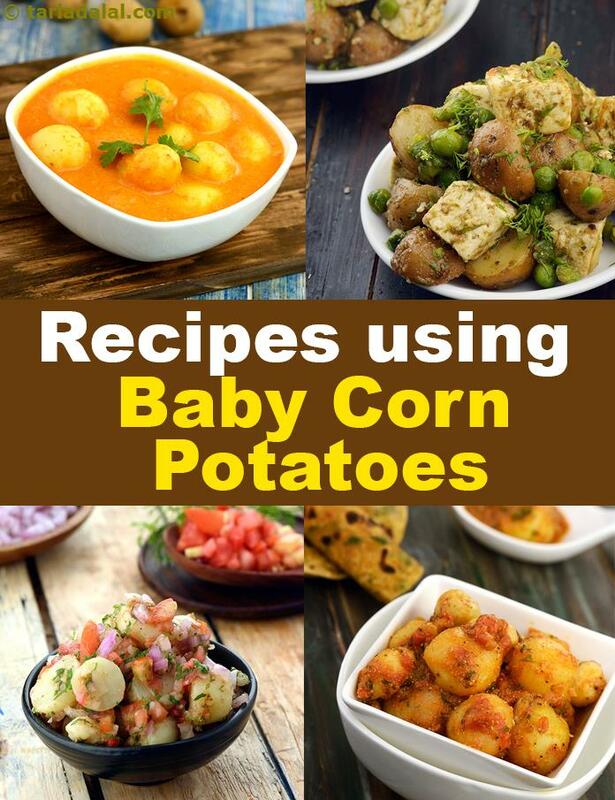 Enjoy our baby potatoes recipes, indian baby potatoes recipes collection below. Extra spicy to complement the chill weather of the mountains, this kashmiri curry is popular all over the country, and abroad. You can make amazing dum aloo in half the usual time, if you use baby potatoes and cook in a microwave.